Tomorrow is the 400th Anniversary of Shakespeare’s death, and many universities, libraries, scholars, and public are joining in the celebration of his life’s work. 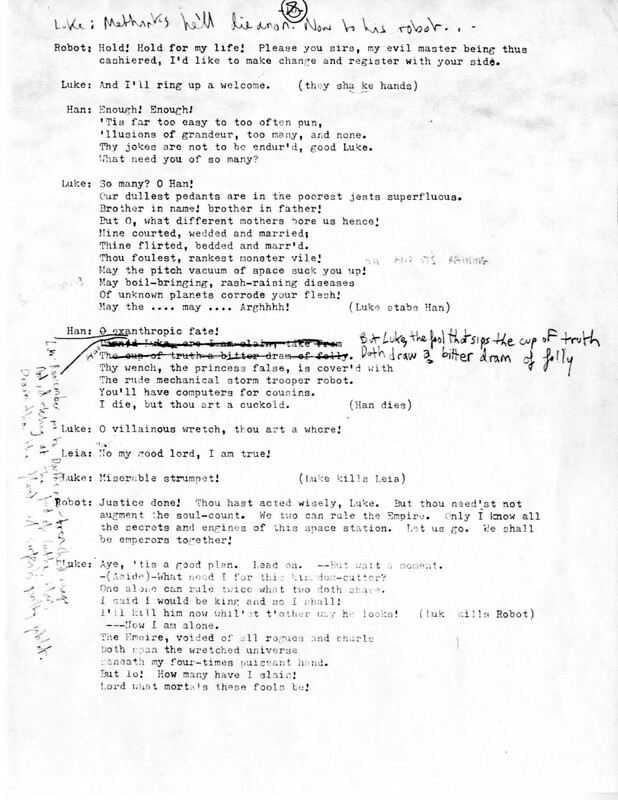 The Indiana University Archives has an alluring assortment of material that document how Indiana University has celebrated the bard’s work over the last 100 years. 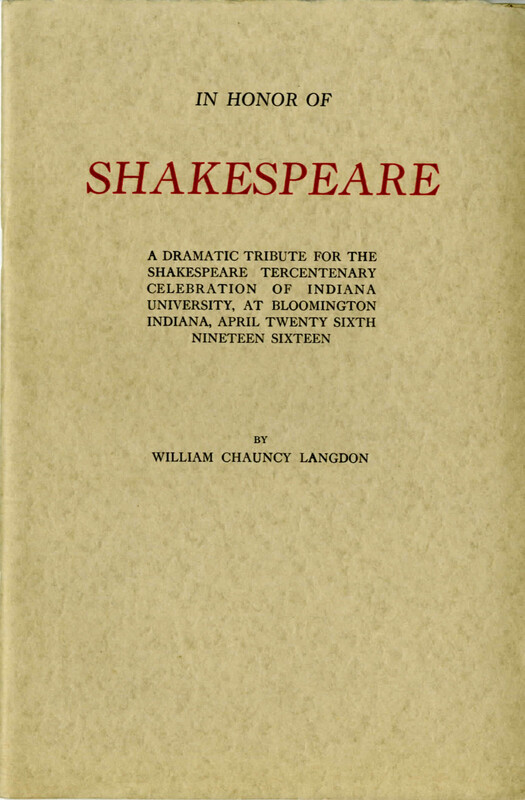 From James Whitcomb Riley’s tribute to Shakespeare to a Shakespearean version of Star Wars and the building of The Royal Shakespeare Theatre, Indiana University has certainly done its part over the years to honor and preserve the works of Shakespeare. 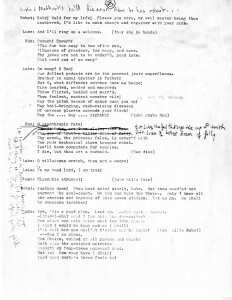 Shakespearean version of Star Wars written by the Indiana University Department of English, 1984. Arguably, the most exciting of the material is a Shakespearean version of Star Wars written in verse by someone in the Department of English at Indiana University. 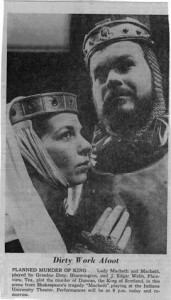 The play was to be performed by students on Shakespeare’s birthday in 1984. Act 1 begins in Luke Skywalker’s spaceship, Luke: “….Darth Vader – that beast – / Will cower from th’ advancing host / When he discerns your forceful visage / Rushing intrepid at the force.” The script is full of wit, and the impeccable verse is impressive. Unfortunately for Leia, she is accused of being unfaithful and is slain by Luke. Han speaks to Leia, “Thy wench, the princess false, is cover’d with / The rude mechanical storm trooper robot. / You’ll have computers for cousins. I die, but thou art a cuckold. (Han dies).” Luke exclaims, “Miserable strumpet!” and kills Leia. Alas, what fools these mortals be. 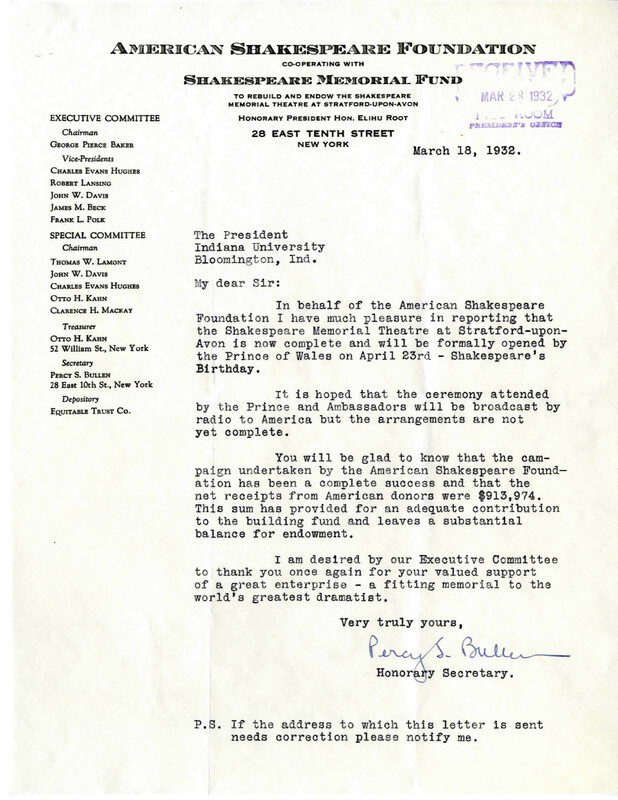 Letter to President Bryan thanking Indiana University for their contribution to the Shakespeare Memorial Theatre, 1932. Under the presidency of William Lowe Bryan, Indiana University contributed funds to the American Shakespeare Foundation to help build the Shakespeare Memorial Theatre at Stratford-upon-Avon. The original theatre burnt down in 1926; the new theatre, The Royal Shakespeare Theatre, was built adjacent to the original site and opened in 1932. 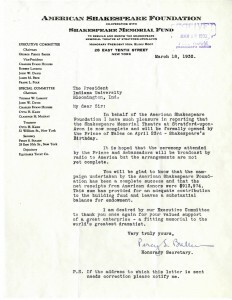 “In behalf of the American Shakespeare Foundation I have much pleasure in reporting that the Shakespeare Memorial Theatre at Stratford-upon-Avon is now complete and will be formally opened by the Prince of Wales on April 23rd – Shakespeare’s Birthday.” Not only was enough money raised to build the new theatre, there were also “substantial” funds left over from the American Shakespeare Foundation for an endowment. Hubert Heffner, Professor of Speech, Theatre, and Dramatic Literature at Indiana University (1955-1971), also served as acting director of the University Theatre from 1959-1960 and 1970-1971. Heffner was invited to a prestigious gala weekend for a celebration honoring the 400th Anniversary of Shakespeare’s birth in 1964. The weekend included a visit to the Folger Shakespeare Library and a reception at the White House, hosted by President and Mrs. Johnson. Listed to the left of the letter is, “Mrs. John F. Kennedy, Honorary Chairman.” Professor Heffner taught courses on Shakespeare at Indiana University. His research and lecture notes are still preserved in his collection and can be accessed at the Indiana University Archives. 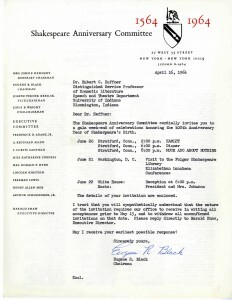 Letter to Hubert Heffner from the Shakespeare Anniversary Committee, inviting Heffner to a 400th Anniversary gala weekend. April 16, 1964. A Tribute at Indiana University honoring 300 Years of Shakespeare. April 26, 1916. Indiana University’s Department of Theatre, Drama, and Contemporary Dance has kept Shakespeare’s works alive and well with their many performances over the years. Macbeth has been among the more popular of Shakespeare’s works, not only for the brilliant plot but also for its length; it is far shorter than his other plays. The Department of Theatre performed Macbeth both in 1965 and this year. If you missed their outstanding performance of Macbeth, fear not! The King Lear project is coming to the Wells-Metz Theatre May 5-8 in honor of the 400th Anniversary of Shakespeare’s death. Murray McGibbon is directing the cast who will perform King Lear in original pronunciation, as it would have been spoken during the 17th century. Indiana University Theatre’s production of Macbeth. December, 1965. 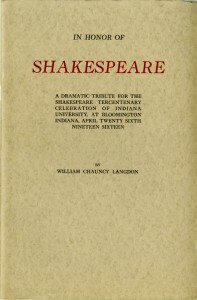 England, Indiana University has played and still plays an important role in honoring Shakespeare and preserving his works. The University is home to some the greatest works by and about Shakespeare. The Lilly Library has the First Folio along with many other magnificent pieces. The Indiana University Art Museum has beautiful works on paper depicting scenes from Shakespeare’s plays and the famous Henry Fuseli painting of The Tempest. 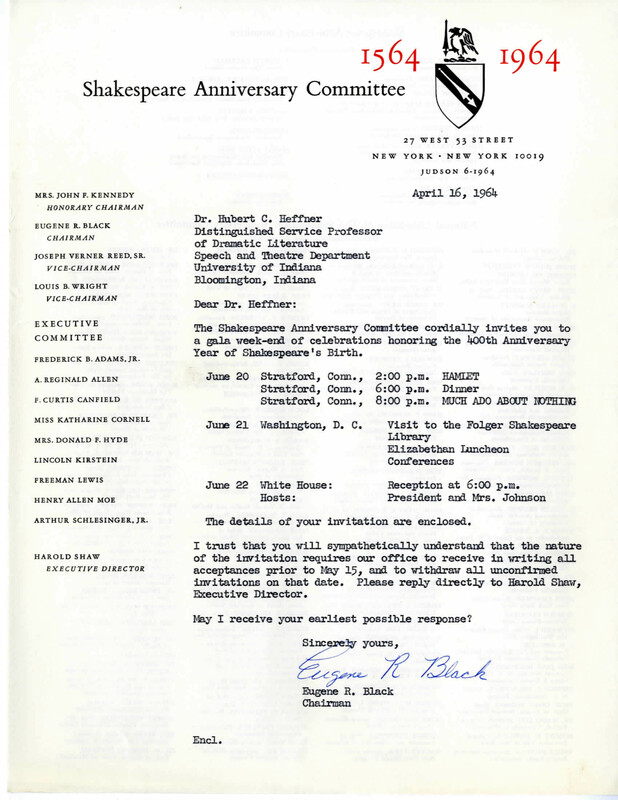 To learn more about how Indiana University has celebrated Shakespeare over the years, visit the Indiana University Archives. 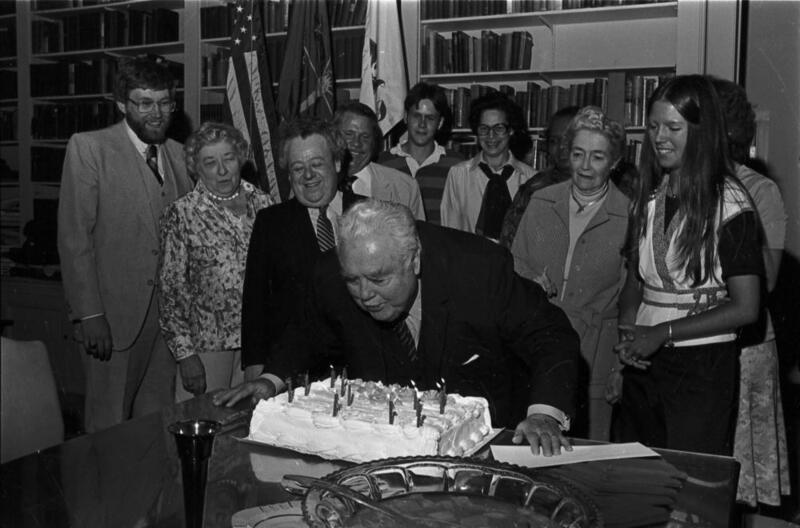 The finding aid for the presidential records of former Indiana University president, Thomas Ehrlich (1987-1994), is now available! President Ehrlich at the 1989 Commencement. Thomas Ehrlich was born on March 4, 1934 in Cambridge, Massachusetts. Ehrlich graduated from Harvard College in 1956 and from Harvard Law School in 1959. Before his appointment at IU, he worked as a lawyer before entering academia, serving as a professor and dean of the law school at Stanford University and later provost and professor at the University of Pennsylvania. He also held two presidential appointments, serving as the first president of the Legal Services Corporation and the first director of the International Development Cooperation Agency. On August 1, 1987, Ehrlich became the fifteenth president of Indiana University. He served in this post for seven years, departing with the title of President Emeritus in 1994. The financial troubles of the early 1990s led to many legislative battles during Ehrlich’s tenure. In order to demonstrate to Indiana legislators the importance of funding for public universities, Ehrlich and his wife, Ellen, held weekly dinners at Lilly House in Indianapolis when the state legislature was in session. Ehrlich also implemented Legislative Days, in which legislators were invited to tour the Indiana University campus, and attend a meal and a basketball game. He successfully helped secure state funding for the renovation of three buildings in the Old Crescent as well as the $18 million Multi-Campus Technology Project. Ehrlich chats with Judith Palmer and Pat Kiely on Legislator Day in November of 1987. Ehrlich was also responsible for initiating and hosting a television series called “Pro & Con.” The half hour program featured Ehrlich and select IU faculty members discussing controversial issues of concern to the public, ranging from topics such as the death penalty and animal research to contemporary music and teaching. The show was taped at the WTIU facilities in Bloomington and broadcast during the spring and summer months by nearly all of the PBS stations in Indiana, with stations in states such as California, Florida, and Virginia electing to air the program as well. “Pro & Con” continued well after Ehrlich’s retirement, continuing through the tenure of his successor, Myles Brand (1994-2002). In a Herald Times article written shortly before he left IU, Ehrlich commented that he felt that among his greatest achievements as president had been the academic agenda and long-term planning efforts aimed at increasing academic expectations, raising overall retention rates, especially among minority students, and improving teaching, research, and service at IU. When Ehrlich left Indiana University in 1994, it was in order to return to teaching and to spend more time with his family. He and his wife moved to California where he was Distinguished Scholar at California State University and taught at San Francisco State University. He then spent ten years as the Senior Scholar at the Carnegie Foundation for the Advancement of Teaching. Ehrlich has been a visiting professor at the Stanford Graduate School of Education since 2009. 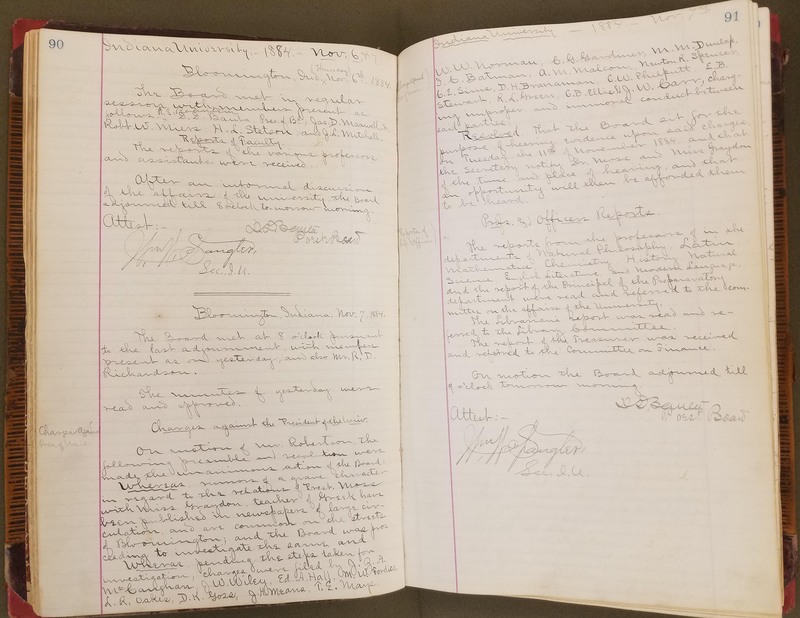 If you’re interested in learning more about IU President Thomas Ehrlich, feel free to browse the finding aid for his records or speeches. Contact the Archives for access or with questions!